Raffle Factory is our solution for online raffles. Organize your own raffles on your website, or allow others to come and post raffles using a variety of features and customizable settings. In order to customize your Raffle Factory component, go to "Components/Raffle Factory/Settings" on the Joomla backend and click on the General Settings page. 1. If Automatic winner selection is enabled, CRON will automatically choose the winner ticket based on random selection. In case you choose to disable it, the raffle owner will have to select the winner manually. This will allow him to choose the winning ticket from a list, however, there will be no names of the ones who bought them or ticket numbers, there will be only randomly generated keys, this way the owner won't be able to see who bought them beforehand. 2. Automatic refund buyers will refund ticket buyers the whole amount spent if reserve price is not reached. 3. Allow users to make Public/Private raffles will let users switch the type of raffle upon creating it. In case you selected "No", you will have to choose the default value for all the raffles on the drop-down menu below. 4. Allow users to set published/unpublished status will allow posters to select one of the statuses when creating or editing the raffle. If the users can not choose the raffle status, then you will have to select a default value from the drop-down menu below. 5. Enable or disable the Hide the ticket number option, in case you wish to display the ticket numbers on raffles or not. In case you choose to hide the ticket number, you can also either hide it entirely or just the last 6 characters. 6. Add a password so you can safely use the CRON script. Choose the desired Date and Time format for raffles. “d” stands for Day, “m” for Month and “Y” for year. “H:i” is for a 24-hour representation of time while “h:iA” is for a 12-hour format. 1. Items per page field allows you to set the default number of raffles shown per page. 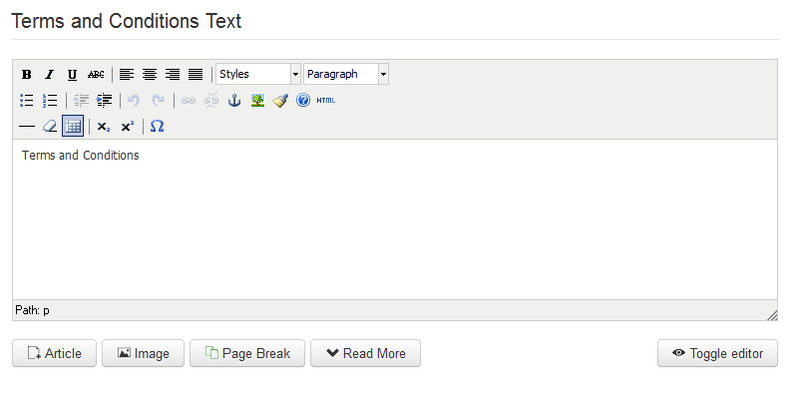 If the number is exceeded, pagination will be created. 2. You can choose to list the raffles from the subcategories of the current category together in the listing. 3. Enable Raffle expiration Hour will allow users to specify an expiration hour for raffles. If unchecked, the raffle expires at midnight. 5. Raffles can be published for certain amounts of time. You can add the maximum number of months a raffle can be published from here. Adding "0" means for unlimited time. 6. Expired or closed raffles are moved to an archive. You can choose from the Months to keep in Archive for how long the period will be before they will be deleted. Choose "0" to keep raffles indefinitely. 7. On raffles you can also allow tags. Enter the maximum number of tags allowed for a listing here . 1. Enable this option to add Instant Messenger information such as YM, Skype and Hotmail IDs for users to fill in on their profile page. 2. Use PayPal email will allow users to add a PayPal email address to be used for retrieving a certain amount from balance. 3. Hide Contact Information will hide users addresses, messenger information or PayPal email from their profile details and listings. 4. With Allow messaging enabled users will be able to write messages on raffles. 5. Once the messaging system is enabled, you can also allow guests to post messages with the Allow guest messaging option. 6. Enable Captcha is recommended to avoid unwanted bot spam in case guests are allowed to post messages. 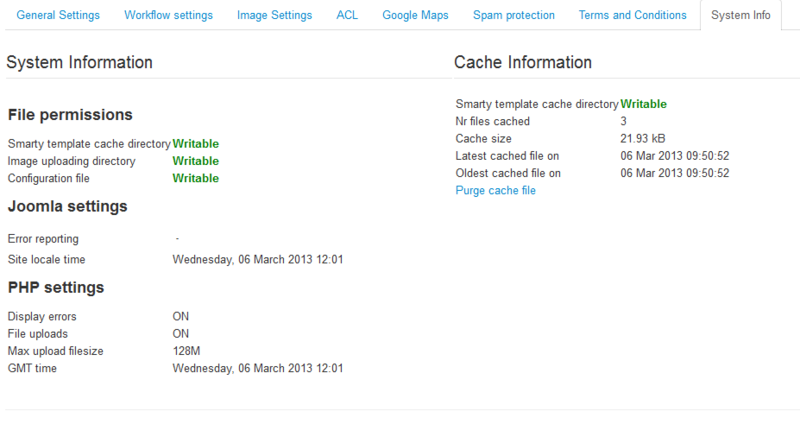 Once enabled, you will need to configure it accordingly from the Spam protection tab. 1. On the Attachments area you can allow raffle owners to ask for a signed NDA (Non-Disclosure Agreement) for each ticket purchase that occurs on their raffles. 2. You can make the NDA Required for all new raffles and set which extensions are allowed for that specific file. 3. Enable Attachment Files allows raffle owners to add various files related to their raffles. 4. Make the file attachments mandatory for each new raffle by enabling Attachment file required. 5. Set the maximum size of the attachment files. This way, you can avoid extremely large files which can slow your website. 6. Set which extensions are allowed for the respective files, .zip, .rar, .txt are available form the start, but you can add multiple types on the list. From the Workflow Settings tab, you can set up a couple of things regarding certain processes of the component. 1. You can choose from 2 ways the users can post their raffles, one with a one-step posting where all the raffle information is entered on one page, and a two=step posting, that will require users to set the category first and then proceed with the rest of the details. 2. Another option you will find here is to keep the new raffles on pending until approved by an administrator from the backend. 1. On the Raffle listing Images you can view the current version of the graphic library and to Disable Images for listings. In case you check this, there will be no gallery on the listings, no image to upload. If the images are not disabled, you can define their properties on the Listing Options area. 2. Add a value for the Maximum picture size and also set a limit for the Maximum number of images per raffle. 3. Check the tick box so that the main picture for all new raffles is mandatory. 4. Choose Gallery Type allows you to select from 3 different gallery layouts that are available and selectable from the scroll down menu: Scroll Gallery, Lytebox and Picture Slider. There are two image sizes that can be set by you on this page. These are not for the full sized versions but for their thumbnails, which are displayed in the listings and raffle details pages. Medium image settings represent the properties of images found in the detailed view of raffles. From this tab, you can enable the ACL feature that will allow you to select specific groups of users that can buy tickets or publish raffles. 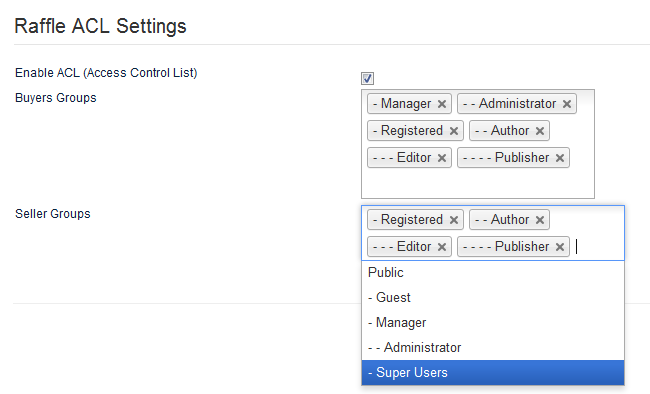 To add a new group to one of the lists, click on the text field and select it from the dropdown menu. In case users who are not sellers try to create raffles, they will be notified about the restriction. This tab allows you to set up Google Maps for raffle location. 1. For Google Maps to be displayed you will need an API key, to get one click on Get API Key and follow the instructions found there. 2. Define settings such as the default map position by pinpointing it with the Pick Position or by adding the coordinates manually. 3. Add the default zoom level of the map, lowest being 1 and the highest being 10. 4. Select the distance unit that will be displayed and the values for it. You can Enable Google Maps in Raffle Details so it will be displayed on every raffle details page. Once enabled, you can define the width and height of the map and select which type of map will be used. To protect your website against spam you can use ReCaptcha and email protection like MailCaptcha. From this tab you can set them up. ReCaptcha can be enabled from the General Settings. You must add a public and a private key for it to work. Click on Get it here to get both of them. After doing so, you can select a theme from the dropdown menu. From the Email Spam Protection area you can enable the email protection by checking the checkbox and selecting which type you wish to be used: Joomla, Smarty or MailCaptcha. In case you choose MailCaptcha, you have to add a public and a private key, clicking on Get it here will take you to the ReCaptcha site to obtain your keys. This tab comes with a simple text editor where you can add the Terms and conditions. Users have to read and agree to the Terms & Conditions by checking the tickbox every time they buy tickets. The System Info tab is implemented to provide basic information about the cache directory, upload directory or configuration file. These are useful for debugging if any issues arise. The component handles the configuration file permissions itself. Even if the configuration file might be Unwritable, the component will still be able to save the configuration and restore previous permissions. Raffle Factory installs with a menu representing 9 menu items which you can modify afterward. List raffles - The place where you can check all the available and archived raffles. Search raffles - The place where you can search for raffles using various details like title, user and more. Categories - Shows you a list of all the categories available and their listings. Raffles on map- Google Maps which displays the raffles and their locations. Watchlist - The place where you can check all raffles and categories of raffles you added to your watchlist. Tickets - Displays a list of bought tickets. New raffle - The place where you can add new raffles. My raffles - Provides a list of all the raffles you created. Profile - Allows you to edit your profile details, add funds to your balance or check your rating. 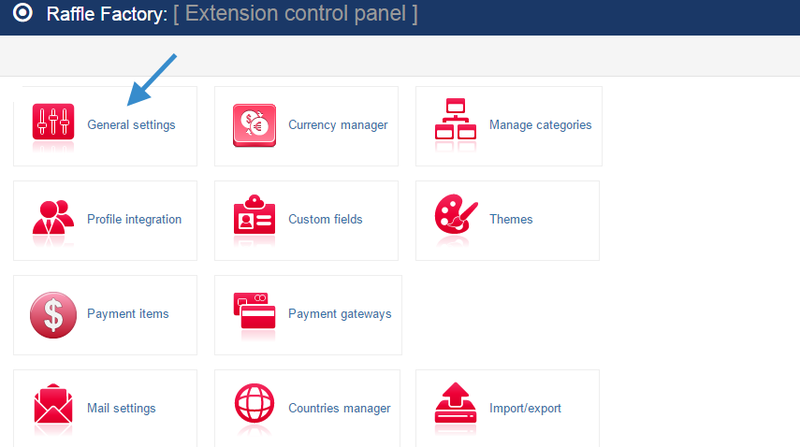 Currency Manager area allows you to manage the currencies used on your website. You can select a default currency so that, when payments are made with other currencies, it will convert them and recalculate the commission automatically. Clicking on New will allow you to add new currencies. Simply add the currency abbreviation and a conversion rate. In case you don't know the conversion rate you can leave the field empty and click on Refresh conversion later on to update it. The CRON script also updates currency exchange rates according to Google. Check out the CRON documentation for more. 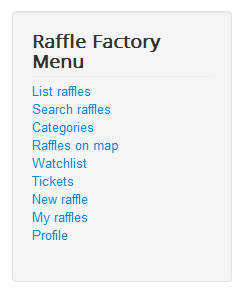 Raffles can be added to different categories depending on what you set from on the backend. Manage Categories area allows you to add new categories or to move them around.